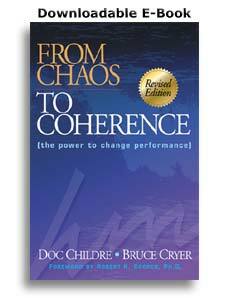 This revised edition of this seminal book is essential for developing people and powerful organizations that respond gracefully to change, crisis and challenge. Well-documented examples, biomedical research and organizational case studies show how to become more effective and reduce stress. Called the "Microsoft of emotional coherence" on Amazon.com. Quick tips, broadly applicable insights, and great stories about real successes. "Provocative and highly practical approach at the heart of business and personal success in the next millennium. A must-read." The One-Minute Manager and Gung Ho! "Added ten years to my life! Provides a wonderful set of antidotes for anyone who lives at cyber-speed!" "If there is hope for a real transformation from the information age to the knowledge age... the concepts presented here are central to it." You will be emailed a link to download the file after your payment has been received.